Okay, I know you don’t buy that. So how about wishing you a happy “Sox Success Day” since the Red Sox have won their first three series of a season for the first time since 1952. But don’t start planning your Duck Boat celebration, just yet. The key for the Sox 6-2 start has been facing a lousy Phillies team, a lousy Yankees team, and a shockingly lousy Nationals team. It helps facing bad teams at the right time, and the Sox bats have taken advantage of this. In their first eight games, the Sox have scored 51 runs, putting them on a pace to score over a thousand runs this season. Not gonna happen. But if they score over 700 runs, they have an excellent chance to be playing in October. The Sox entered this season with an arsenal of batting power and the Red Sox Nation has seen these guys start to do their thing. They also entered the season with questionable starting pitching, and so far it remains questionable. Just like the batting to this point is a snapshot in a long season, so is the Sox starting pitching with its 5.13 ERA. And that is why the key to the success of the Sox season may rest in the bullpen. Just like the complex actual tax code, baseball is filled with its own numbers of inequity. Take a look at Tuesday’s 8-7 victory in which Justin Masterson, was charged with all seven runs. Now Masterson allowing seven runs should not come as an enormous shock. After all, last season no pitcher had more starts in he allowed 5+ earned runs than Masterson’s 13. So last night was number one of his season thus far. But let’s continue looking at the box score and we can see that Alexi Ogando pitched 1 1/3 innings allowing one hit and striking out two. Good job by Ogando, or was it? When Ogando entered the game with two down in the 6th, he allowed a two-run triple to Michael Taylor that gave the Nationals a 7-5 lead and put Masterson in position for the loss because the two runs that scored were attached to him. The fact that Ogando struck out the next batter was, in essence, one batter too late because he allowed the runners he inherited to score…and both were charged to Masterson. The Inherited Runs Scored is vexing to the manager and taxing to the pitcher who preceded the reliever. 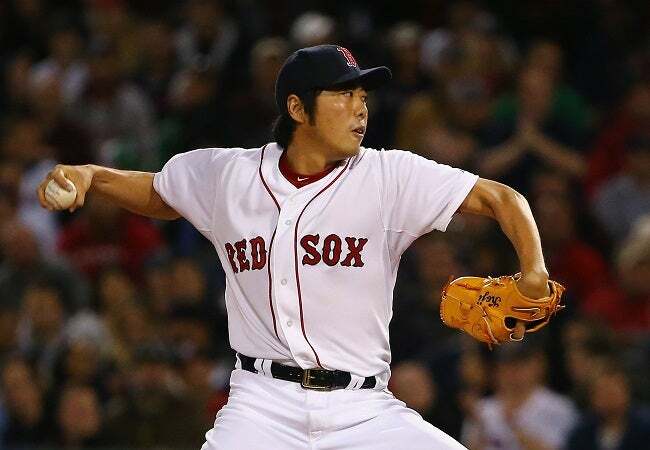 •	Koji Uehara (who dodged a bullet in his return on Tuesday) inherited 10 runs and allowed five to score, not a particularly good 50.00 IRS percent. •	Junichi Tazawa inherited 32, allowed 12 to score for a rate of 37.50 percent. •	Edward Mujica inherited 14, allowed four to score for a rate of 28.37 percent. •	Burke Badenhop (who will be missed this season) inherited 58, allowed 16 to score for a rate of 27.59 percent. •	Craig Breslow inherited 16, allowed two to score for a rate of 12.50 percent. •	And finally, the pitcher who the Sox most dangerously did not replace: Andrew Miller inherited 26, allowed two to score for a sparkling rate of 7.69 percent. Yes, I know the last thing you need is something else to pay attention to, but the IRS percent is a stat that you should be interested in every single time a pitcher enters with runners on base. And do yourself a favor, don’t think of today as Tax Day, think of it as Jackie Robinson Day celebrating an event that changed America and perhaps the world.